Pretty traditional rustic style Spanish cortijo/cottage, only 10 minutes by car to the centre of Salobrena town and beach. The property is on a hill accessed by a fairly steep drive with wonderful views of the Sierra Nevada and Mediterranean. 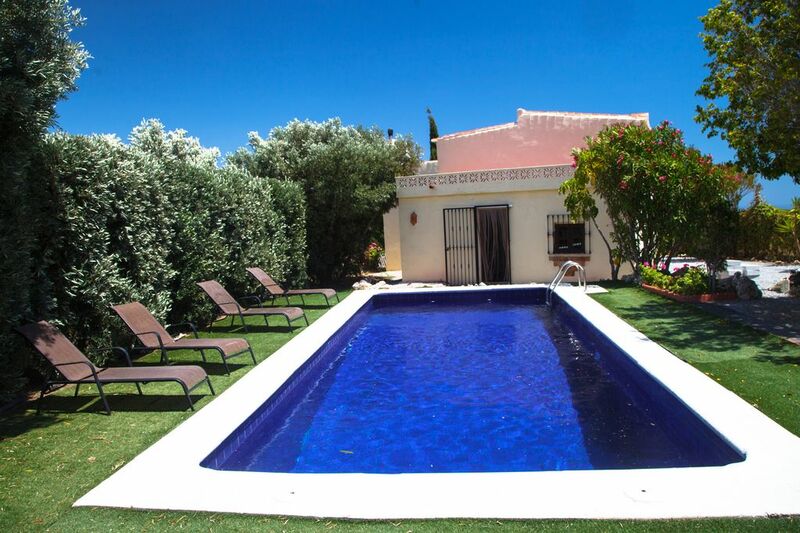 There is a private pool with sunloungers, barbecue area, outside bar and terrace. Two bedrooms, one double, two singles, fold out bed is available at request for extra fifth person. Two bathrooms. Good access by road. Car is essential. We had a lovely holiday at Cortijo San Bernado, mainly spent around the huge pool and BBQ/bar area in the private garden. Everything inside is well appointed and clean - two good bathrooms, decent bedrooms with ceiling fans and a kitchen with cooker, microwave and dishwasher + big fridge/freezer. Perfect for a family of four. A car is essential since the cottage is in a very rural area well out of Salobrena town and it's supermarkets. That said there are other houses and farms near to the cottage, bright lights of coastal towns and roads in view but this didn't create much in the way of disturbance, our kids were still by far the noisiest thing around! Suzanne was a brilliant host, answered all of my questions quickly, was really flexible about checking in and out and made sure we knew that she was only a short drive away if we needed anything, so there was no stress leading up to or during our stay at all. Just a little note to say thankyou so much for the use of your villa in spain, we were there at the end of July 2010 for a week and had planned to explore the region, but ended up just lounging round the beautiful pool all day reading and relaxing, only venturing out for supplies. The villa had everything (and more) that we needed, although to be honest we spend all of out time outside in the new bar area. The views of the sierra nevada mountains was a pleasure to wake up to, as well as cloudless skies. Thank you Suzanne for allowing us to discover this place ! Our holidays was very nice. The view, the Spanish cortijo, the pool... Great stay in Salobrena. The way to get to the house is a little hard, but it's worth it ! The children were delighted ! The Costa Tropical, being less well known than its more popular neighbor, the Costa del Sol, is no disadvantage for Granada's coastline with its subtropical climate. Its beach resorts still retain a Spanish character and it boasts some spectacular cliffs, interspersed with secluded coves and sandy beaches. The jewel of the Costa Tropical Salobrena is a whitewashed township clinging to huge lump of rock just back from the shoreline, topped by a Moorish castle and surrounded by lush sugar cane plantations. A mere 45 minutes from Granada, and just over an hour to the Sierra Nevada, Salobrena is also ideally situated for exploring the Alpujarra, some forty minutes away. From October to April, you could be in the happy position of being able to ski during the day and return to sunbathe on Salobrena's long, clean beach in the evening.